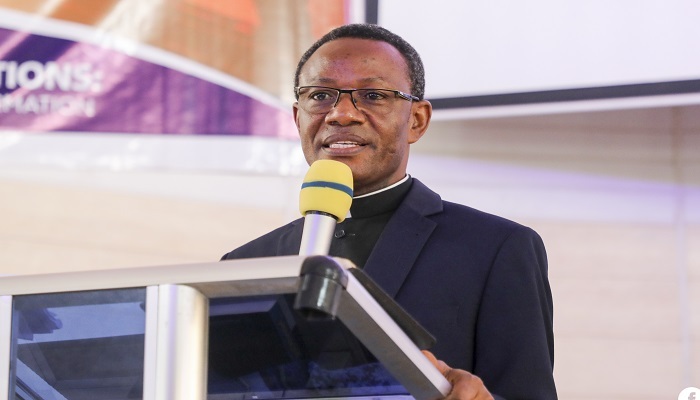 The General Secretary of The Church of Pentecost, Apostle Alexander Nana Yaw Kumi-Larbi, has called on Christians to make every effort to keep the unity of the Spirit, because they were all baptised into one Spirit to form the Church, which is the body of Christ. According to the General Secretary, Jesus Christ built the Church with His own body, and that there should be no division in the body of Christ because every part of the body is indispensable as they play a distinct function in the body. He explained that no one is unimportant in the Church since Christ works through all believers. “Every Christian possesses a gift; we have been called to use our gifts to build the body of Christ. Each member is also called to serve the church with our own natural abilities,” he said. Apostle Kumi-Larbi said this in a sermon at the Asamankese Central Assembly during the dedication of the newly built Asamankese Area Office on March 13, 2019. Speaking on the topic, “The Structure of the Church” with his main Bible text taken from 1 Corinthians 12:12-27, he said that just as a body, though one, has many parts, so it is with Christ, saying, “Though we were all from different backgrounds and cultures, we have been baptised by one Spirit to form one body [the Church]. He explained that, ‘arrangement’ and ‘relationship’ are the two key words in the term ‘structure.’ He pointed out that the body has no division, and that the church of God is built on one body. He further explained that, the body of Christ refers to the members in the church who have agreed to follow Christ’s teachings and to obey His word. The General Secretary urged Christians to stay in the calling of Christ and endeavour to demonstrate genuine love towards one another because they believe in one God, one faith, one spirit and have received one baptism, according to Ephesians 4:1-6. Further reading from Ephesians 1:22-23, he stated: “Every Christian must admit that Jesus Christ is the head of his life, family, work, and the church. He indicated that since four out of the five senses- sight, taste, smell, and hearing are all found in the head area, it is the head that largely controls the body. “So if Jesus is the head, He directs, protects, leads, provides, speaks and does everything for us. Therefore, we must obey and follow Him,” he added. Touching on the expectations from the parts of the body, the General Secretary said that members of the church have been called to promote truth and unity. He, therefore, charged Christians to be truthful and honest in all their dealings. He also said believers are called to serve Christ and humanity. In attendance to grace the occasion were Area Heads of the Church in Eastern Region, ministers in the Asamankese Area, the Chief of Asamankese, Osabarima Adu Darko III and his elders, the Municipal Chief Imam, Alhaji Alhassan Hussein, and the Zongo Chief of Asamankese, Masawudu Fuseini.